Young people attending the Otesha Projects Green Jobs training scheme have just completed our Seed To Plate course. 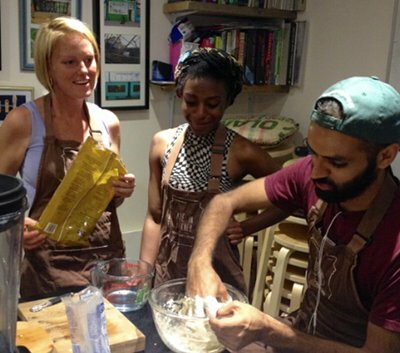 The programme covers what organic means and why it's good for people and planet, local food sourcing and growing in the city, healthy cooking techniques and environmental/health benefits of eating a predominantly plant based diet - and all the awesome recipes that help people eat like that. Next week they'll be starting Harvest To Jar, our radical preserving course where we enthuse young people about the health and environmental benefits of getting your jarring on - all using a much reduced amount of sugar to conventional preserving methods! It's a pleasure having you in the kitchen guys!